Whatsapp Adds New Feature to Pin Your Favorite Chats - Something New Everyday! Every day, billions of people use Whatsapp. Unfortunately, being part of Whatsapp also means dealing with those annoying groups where you get a million notifications if you are busy and aren't keeping up. Finding out chats that are important takes a bit of scrolling if you're part of a lot of groups but thankfully, this problem is solved now, at least in the the upcoming Whatsapp beta. The latest version of WhatsApp beta now includes a new chat pinning feature. As the name suggests, it allows you to pin individual chats or groups at the top of the chats tab. If you have certain groups or chats that you frequently use, you can pin them at the top. For now, you can only pin 3 different chats in the latest beta version. It's still better than nothing. To pin a chat, tap and hold it and you will see a 'pin' option next to archive and mute options at the top of your screen. If you try pinning more than 3 chats you will get a message from WhatsApp telling you that you can't pin any more chats. 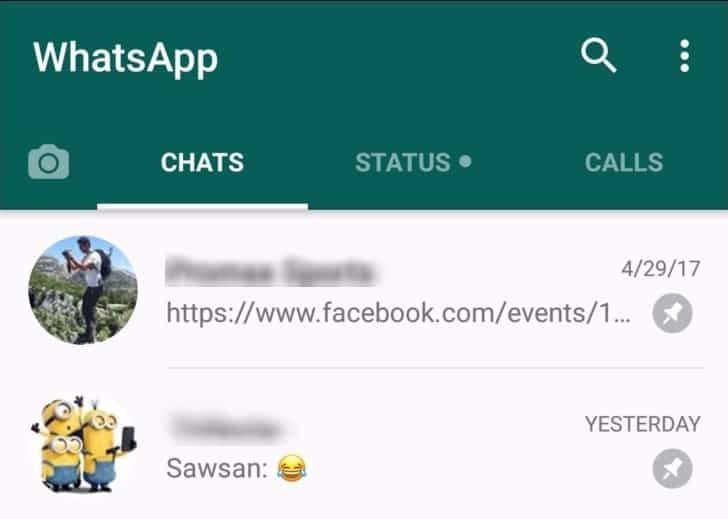 Earlier Facebook added the popular SnapChat Stories feature to WhatsApp. Instagram got the feature a while ago. It works the same way in that you can add a caption (the story) to an image which sticks on your profile for up to 24 hours. You can try out the new feature for yourself by downloading the beta APK here (for Android users only). Proceed with caution as beta versions of any app are prone to having bugs, glitches and other issues.